Navajo Falls was the first major waterfall that we saw as we followed the Havasu Creek downstream from Supai Village during our November 2002 visit to the Havasupai Indian Reservation. It’s said to tumble some 75ft through thick brush, which conspired to make photographing the waterfall a bit difficult as you can tell from the photos on this page. 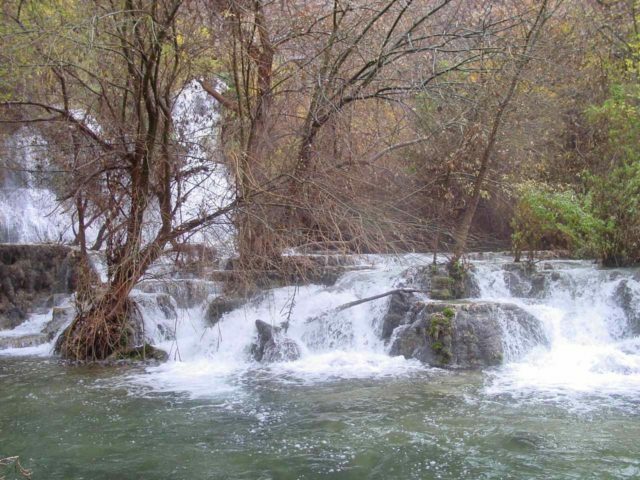 For no matter where we went, we were never able to get a full view of the waterfall. 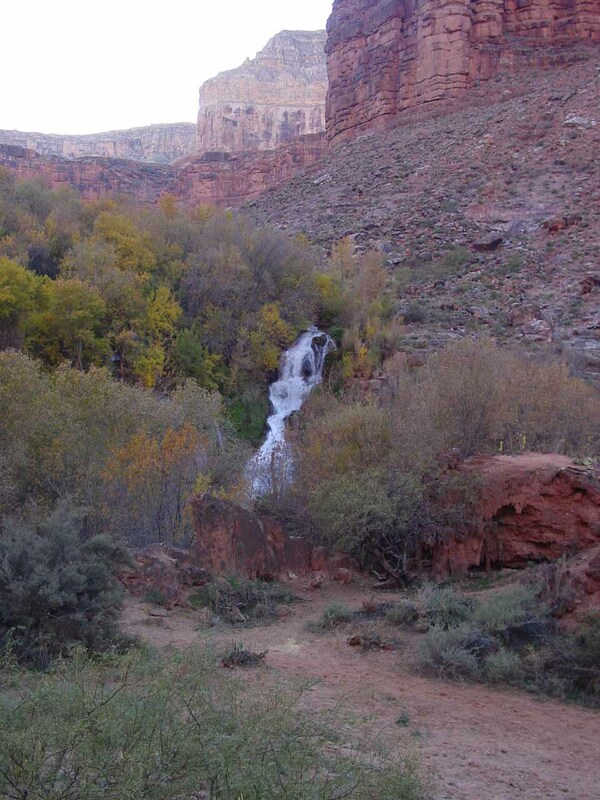 We noticed this waterfall roughly 3/4-mile from Supai Village. 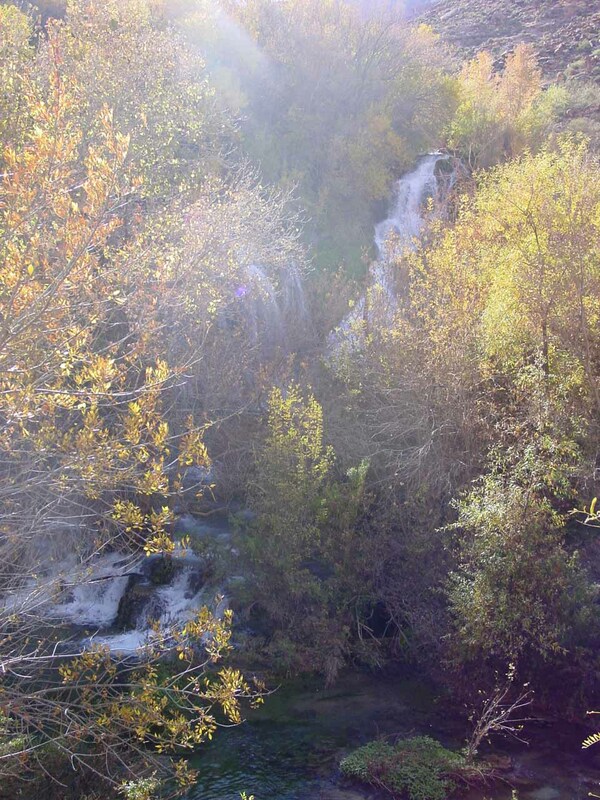 There was an unsigned spur loop that descended closer to another steeper path that took us right down to the base of the waterfall. While the view from the end of the trail was blocked by foliage (see photo at the top of this page), in order to get past the foliage, I had to either balance precariously on logs or just wade in the creek. And as you can see from the lack of clean photos of the falls, I did neither. Unlike Havasu Falls and Mooney Falls (which were both plunge waterfalls), this one was more of a cascade. 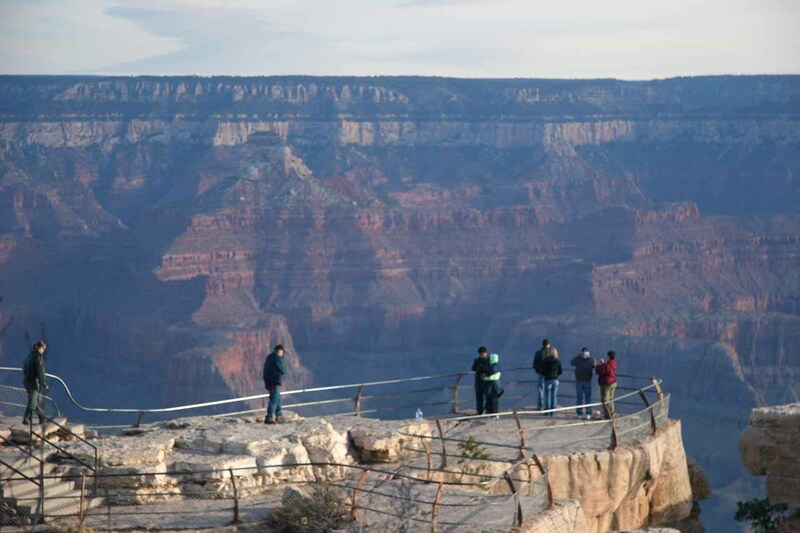 We were able to get somewhat contextual views from the top of the cliff upon which the trail was on, but the lower sections would always be blocked. 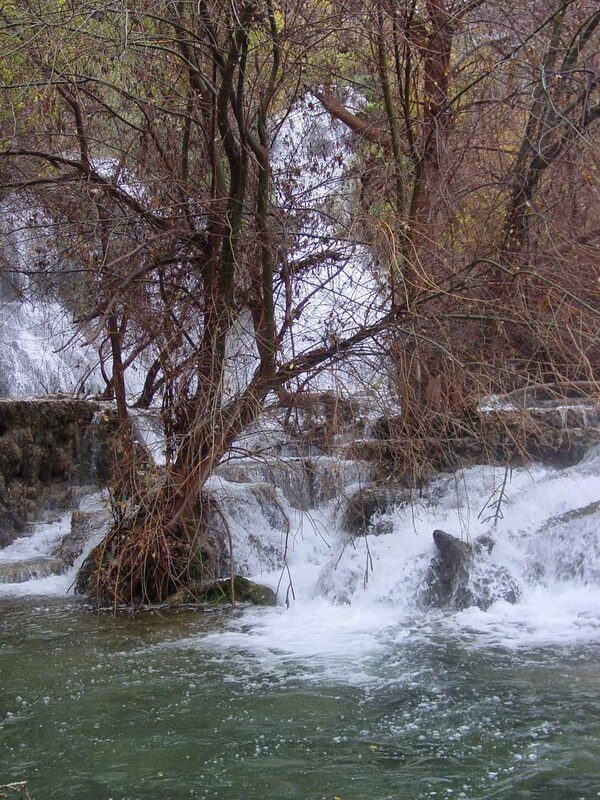 In the late Summer of 2008, a massive flash flood swept through Havasu Canyon and altered the watercourse of Havasu Creek. 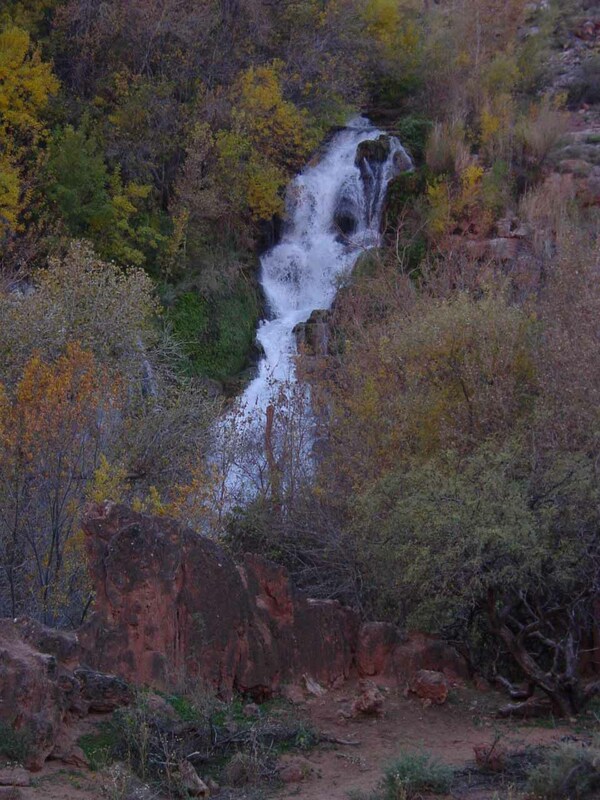 The result was that the creek now bypassed Navajo Falls (thereby drying it up) while creating two new waterfalls. 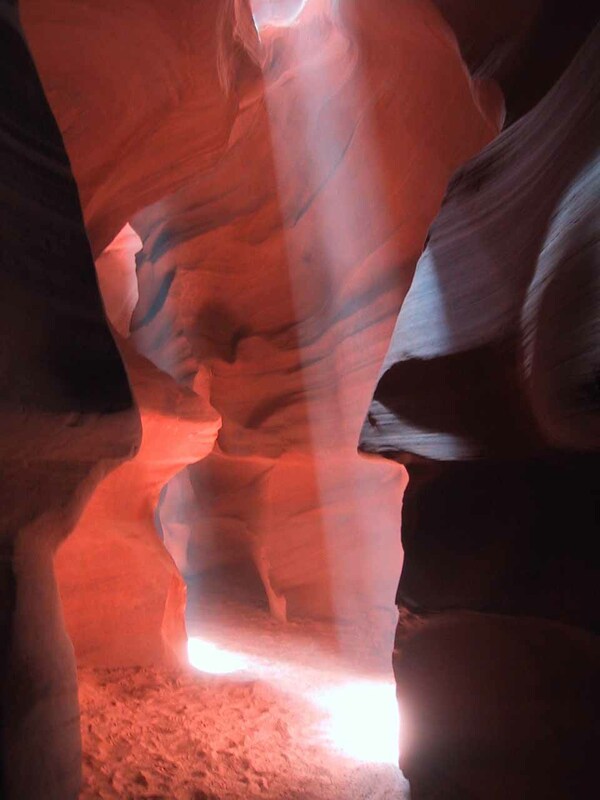 Julie and I are keen to return to Havasu Canyon to see for ourselves the dramatic changes that have occurred as a result of the 2008 event. 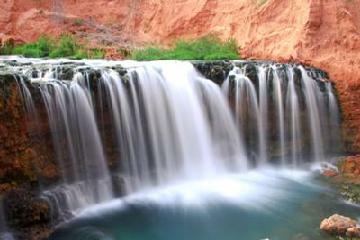 Navajo Falls and Havasu Canyon are administered by the Havasupai Tribe in the Havasupai Reservation. For information or inquiries about this reservation as well as current conditions, visit the official Havasupai Tribe website. 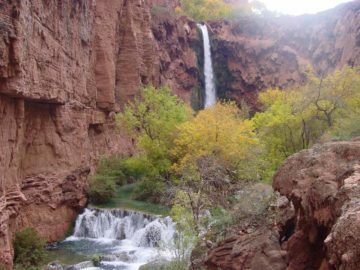 This waterfall shares the same trailhead and hiking trail as Havasu Falls. 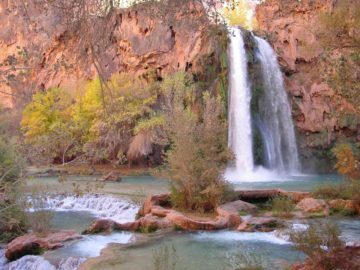 So see the Havasu Falls page for both the driving directions and the trail descriptions up to Supai Village. 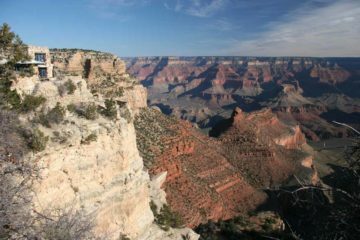 For context, the hiking begins from the Hualapai Hilltop, which is roughly 60 miles from Peach Springs. Peach Springs is about 50 miles northeast of Kingman along the I-40.